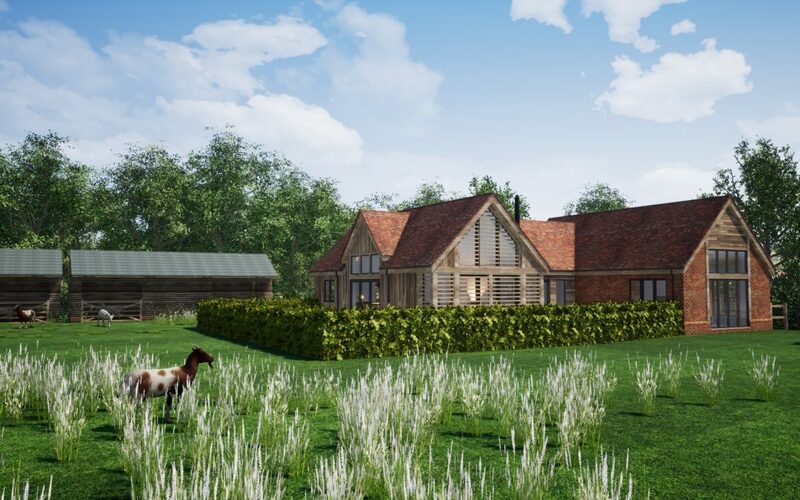 Studio Four was originally appointed in early 2018 to assist with a Planning application for a new build house on agricultural land in Ringwood. Over the last year the client has been working closely with a Planning consultant to develop the project. The design of the new house was limited in area to 120sq m and form with a low ridge line, and we have therefore designed an efficient single-storey building that provides the living, kitchen and dining spaces in one element, with three bedrooms located in a second element. A central entrance space connects the two forms, whilst creating an external private courtyard. The building primarily faces south, maximising views across the new modest domestic garden, and beyond to the grazing paddock. The proposal seeks to provide a compact home of high quality with a safe garden for a young family, ensuring the close proximity and welfare of their pet livestock, and re-establishing a sustainable area of grazing paddock.